mommy's reviews: Get the Runway Look With Mary Kay! While I have never been to a fashion show I have seen bits and pieces of them through news stations, YouTube videos and other media outlets. Runway models always seem to have perfect hair, perfect skin and perfect bodies...a reality check reminds me that I have none of these characteristics! Being a mom of two and currently 33 weeks pregnant with my third, my body is far from perfect. But that doesn't mean that I cannot try to look my best. When you approach someone, what is usually the first thing you look at? I tend to look at someones face. So, I have decided that probably from my shoulders on up is where I want to try to look the best. I have been using Mary Kay products since I was a teenager (I LOVE their perfume!!!) and still use them today. Whenever I am trying to put my "best face" forward, their products are usually what I reach for. Today, I am going to show you some products from their cosmetic line that are sure to give you that runway look, without having to go to a professional! 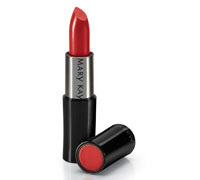 The first product that I tried in this lovely selection was the Really Red Creme Lipstick. Now, I have VERY fair skin so I knew that this would probably not look the greatest on me. I don't wear red normally (unless I am painting my toe nails!) so this was a bit on the wild side for me. As you can see, it is a beautiful lipstick, just not my color of choice. Next, I decided to try and apply the eye makeup. I am NOT good at applying eyeliner so my attempts at that were pretty sad. I love how easy the Liquid Eyeliner went on though...it definitely was great to work with and did look nice. After applying that I went with the Lash Love Mascara and I LOVED how it wasn't goopy or left clumps on my eyelashes. I always go with black when using mascara so this was a perfect product for me! Then, I tried the Foundation Primer. This product is a light-weight gel primer that acts as a base for your foundation. It also helps the foundation go on much smoother and more evenly as well. I could honestly wear this by itself as it is so silky and smooth...it makes my skin feel great! It also contains sunscreen so that would definitely help to prevent sunburn on your delicate facial skin. The Luminous Wear Liquid Foundation was so great to use as well. Because I have fair skin, I chose to apply the Beige 1 color as it is light. It did look very nice on me and applied easily and evenly as well. Each of these Mary Kay products differ in price and you can find them directly on Mary Kay's website or find a beauty consultant near you to help you find your perfect colors. So, in my opinion...Mary Kay can really make your face look like runway perfection! I was very happy with my "look" (aside from the raccoon eyes) and how nice it felt to look my best. I would definitely recommend these products to any woman who is desiring a new look or just wanting to freshen up her current line of make-up. Disclaimer: I received no monetary compensation for this post. I did receive free Mary Kay products for review purposes from Mary Kay. All quotes and stock photos are from the Mary Kay website and email. All thoughts and opinions are 100% mine.